Actually, pretty much this. Even some of the richest people in this country want their taxes raised. I think the Republicans are milking the TAXES ARE BAD NO MATTER WUT thing that worked so well in 2010. Income tax is not applied to existing wealth. 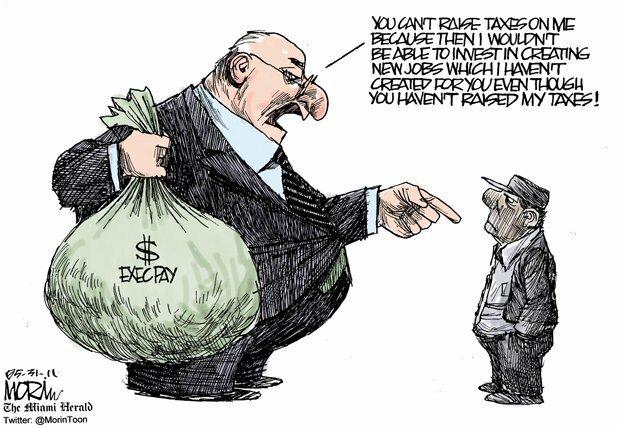 If these rich people really want to pay more there is nothing to stop them from cutting a check to the treasury and nothing to stop them from taking every deduction, shelter and other accounting strategies to minimize their tax liability. It is great to advocate for higher tax rates when it will have a minimal personal impact because your wealth is already established and there are numerous ways to move your money so that it won’t be subject to the increased rates. Political parties don’t matter and neither does the president. The system is broken. DC and Wall Street are corrupt. It’s like this: In a democracy, people get the leaders they deserve. Unless you’re a conspiracy theorist, then you only get Illuminati puppets. We still get puppets, but that’s only because the average voter is so easy to manipulate. Its a good thing that the US is a republic and not a democracy. The most significant results of democracy in action in the US were the Jim Crow laws passed by democratic means, by democratic politicians, elected democratically all the while violating the laws of the republic. Take a civics lesson before you try to split hairs, Dr. Evil. Yes the country is a republic, but you are aware that are leaders are democratically elected? Jim Crow laws were terrible, but otherwise you’re demonstrating the same intellectual dishonesty as everything else on this page. On the same token, what do you think of the civil rights act, which was supported by the Democrats and opposed by the Republicans? Or Proposition 8 in California? of the people who are planning on running against obama in the next election, can you think of anybody you would rather have than obama? Dr. Evil really wants to live in a plutocracy.